This is a highly detailed portrait of an unidentified woman in a domestic milieu. 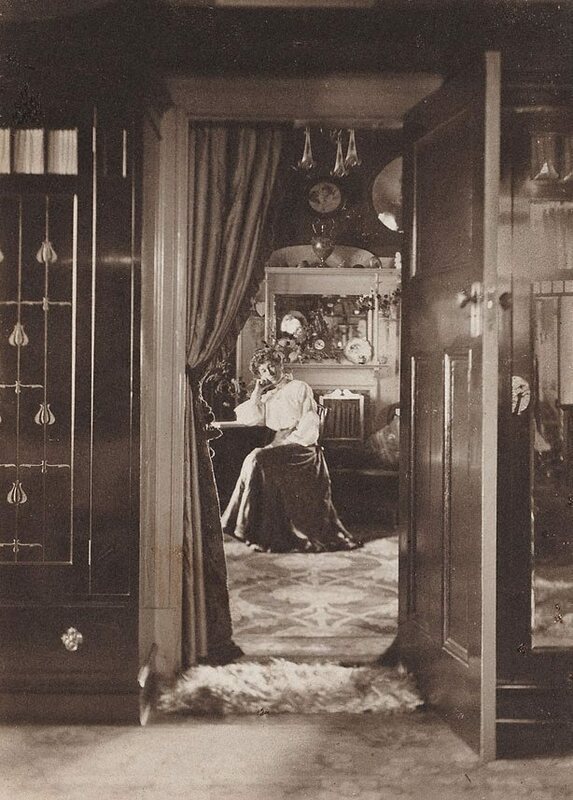 It is neither typical of the standardised aesthetic of Cazneaux’s studio portraits, taken under commission at Freeman’s, nor his later photography of glamorous women for The Home. Cazneaux’s subject sits pensively at the table, turning her head to meet the camera’s lens. The thick doorway re-frames her form inside the photograph. The heavy, drawn curtain on the threshold of the passageway adds an element of theatricality to the portrait and emphasises the photographer’s position, looking from the ‘outside’ in, onto the woman and the cluttered sitting room. Harold Cazneaux was born in Wellington, New Zealand in 1878. His parents, Pierce Mott Cazneau and Emma Florence (née Bentley) worked in commercial studios in New Zealand before returning to settle permanently in Adelaide during the early 1890s. At the age of 18 Cazneaux went to work alongside his father at Hammer & Co studio as a retoucher. He moved to Sydney in 1904 to join the larger portrait firm, Freeman’s quickly ascending to the position of ‘chief operator’ (as camera portraitists were known). Studio work had little scope for creativity. Cazneaux used his time walking to and from work to experiment with pictorialist aesthetics 1. The Photographic Society of New South Wales organised an exhibition of Cazneaux’s photographs in 1909, the first such solo exhibition of its kind in Australia. In 1916 he and fellow pictorialist photographer, Cecil Bostock founded the Sydney Camera Circle. The group was particularly interested in the how pictorialism could be adapted to and extended within an Australian context. The mechanised, standardised and frenetic pace of Freeman’s increasingly took its toll on Cazneaux’s creativity and health, and he resigned in 1917. He moved with his wife and daughters to the Sydney suburb of Roseville, and in 1920 he was employed as the official photographer for The Home magazine. This new position let him work in a varied indoor and outdoor environments. In 1938 Cazneaux was awarded an Honorary Fellow of the Royal Photographic Society of London. He continued to work until his death in 1953.